It's a Mommy Monday, and today I am bringing you an update on my pregnancy and sweet Paisley Jean! A few weeks ago, I was given Paisley's estimated date of delivery - December 19, 2014!!! Since I had two previous c-sections I get to schedule another one! So this means that unless I go into labor sooner, my sweet baby girl will be here just a few days before Christmas! And of course I am counting down. First of all, I cannot wait to meet Paisley! And second of all I feel like I have been pregnant for three years at this point! I am hoping that all of the upcoming holiday festivities will make these next few weeks go by quickly because I am definitely starting to get tired and uncomfortable! Tomorrow, I am going to the doctor for a 32 week growth scan ultrasound! I cannot wait to sneak a little peak at this girl. I am going to a new doctor for this pregnancy and they do not do ultrasounds the way my old office did (which was at every single visit for the most part). So I cannot wait to see her little face on that screen! My last ultrasound was at 20 weeks! Oh and at this point Paisley should be measuring 3.75 pounds and I am very curious to see what they say she weighs...since both Lacie and Blakely measured well over 5 pounds at their 32 week appointments! And while I know people argue that those measurements are off...mine have always been right on! I had two very gigantic, healthy babies! Me and my 29 weeks Baby Bump! 30 Weeks!!! Paisley is growing! I love getting my What to Expect Updates, and when I hit week 30 I was very happy. 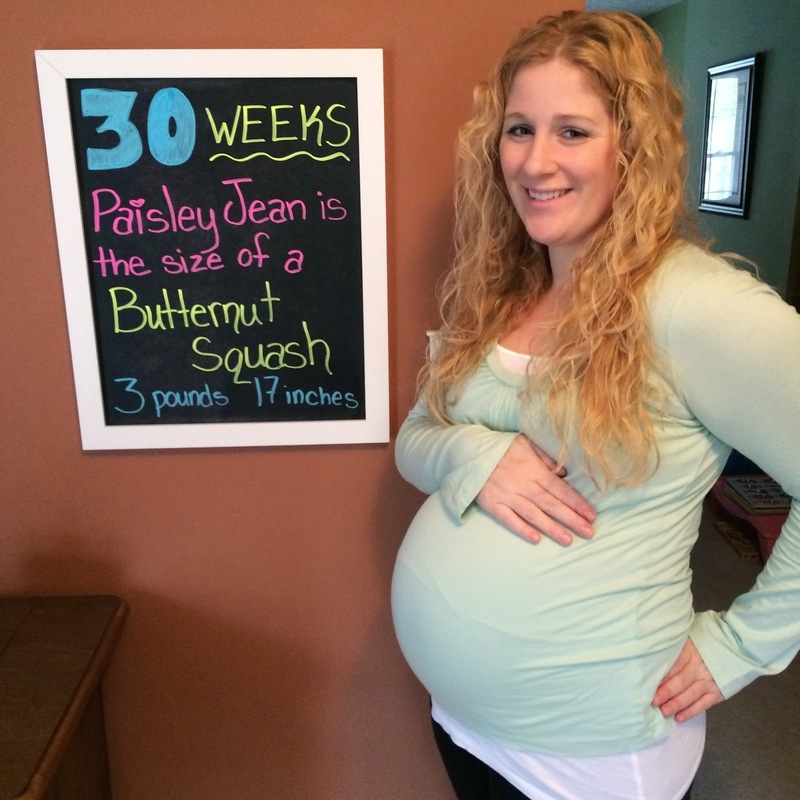 30 weeks sounds so much further along than 29 weeks! 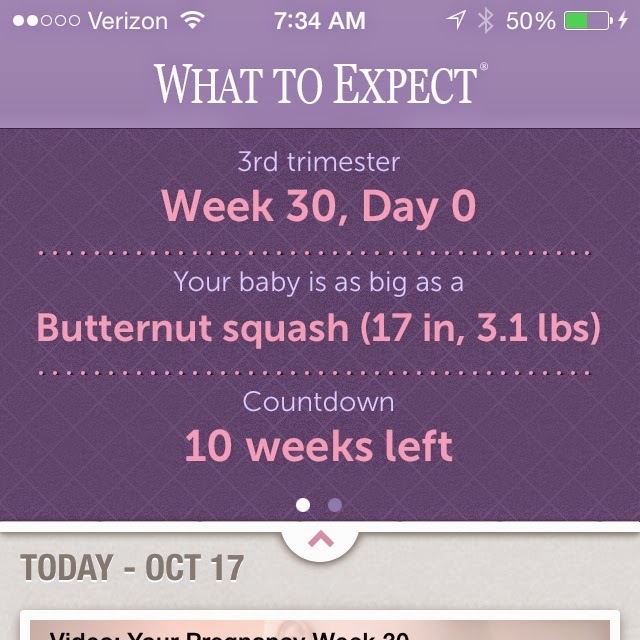 On Halloween, I hit the 32 week mark which is equivalent to 8 months!!! I love your chalk board! My youngest is now nine years old and yet I still remember being in your shoes like it was yesterday. Enjoy every moment ahead of you! The last few weeks stretch out long and slow, but will be behind you before you know it. I recently had my third baby, too. I always anticipated my What to Expect notifications/emails! Your pictures are so cute! Love the chalkboard!